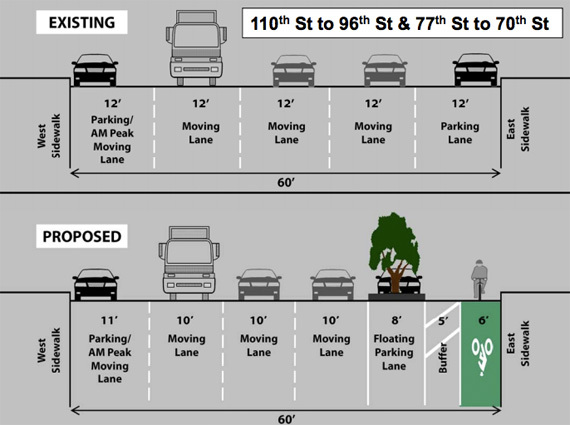 Last night, Manhattan Community Board 7 signaled its support for an extension of the Columbus Avenue protected bike lane — which currently runs one mile, from 96th to 77th Streets — north to 110th Street and south to 69th Street [PDF]. The 26-11 vote (with one abstention) was a much wider margin than CB 7’s 23-19-1 vote in favor of the initial Columbus Avenue bike lane segment back in 2010. Attendees at last night’s meeting were overwhelmingly in favor of the bike lane, with 29 speaking in favor and only two against the plan. Many wore pink stickers from the Upper West Side Streets Renaissance Campaign to show their support. Before the vote, CB 7 Chair Mark Diller expressed his support for the plan as well. Calling it “imperfect but worthwhile,” he said the community would be better off with the safety benefits the redesign brings to the street. Diller added that, unlike many other city agencies, “the Department of Transportation seems to care what we think,” and that the community board would have to continue its dialogue with DOT to ensure that the project is successful. The protected bike lane extension will bring the types of safety benefits seen on the initial segment — pedestrian injuries dropped 41 percent — to dozens more blocks, but it won’t provide a continuous link to the Ninth Avenue bike lane, at least not yet. One aspect of the plan that may be reexamined is the absence of a protected lane south of 69th Street, where DOT is proposing an additional vehicle lane (currently there are three), one of which would be an “enhanced shared lane” similar to the shared lanes on First and Second Avenues in Midtown. By wringing additional car capacity from the street, while doing very little for bike riders and providing no improvements for pedestrians near the dangerous bowtie intersection with Broadway, DOT’s plan upset both bike lane supporters and opponents on the board. DOT is not currently proposing a street redesign south of 65th Street due to construction on the city’s third water tunnel. At a prior meeting the agency said it would work with contractors to install a temporary bike lane similar to the one set up for water tunnel work on Ninth Avenue in Hell’s Kitchen. The board adopted an amendment from Mel Wymore requesting that DOT work with the board on a comprehensive plan for bicyclist and pedestrian safety south of 69th Street, to be implemented upon the completion of water tunnel construction. Council Member Gale Brewer spoke after the public comment period but did not mention the bike lane at all, instead offering updates on real estate development projects and other neighborhood issues. I asked Brewer after the meeting why she chose to ignore the bike lane in her public comments. “I knew it was going to pass,” she said. “Last time I got in trouble,” Brewer added, referring to her remarks before the transportation committee in December, when she was supportive of the lane but did not press for a vote in favor. In January, she came out in support of a “yes” vote from the full board. Borough President Scott Stringer, who also spoke at December’s committee meeting but did not press for a favorable vote, was not in attendance last night. Stringer and Brewer appoint most of the board’s members. DOT staff said that, with community board support, the lane would be installed before the end of 2013. Construction is expected to take approximately two months. Way to take a leadership role, politicos. I’m glad to see that there is overwhelming opposition to the addition of more car lanes on the Upper West Side. Seriously, what was DOT thinking when they created that part of the plan?? Hopefully, this vote and discussion will give DOT the political backing to truly connect the Columbus Ave & 9th Ave bike lanes and will make DOT think twice before trying to squeeze even more car traffic through our dense urban neighborhoods. Superb work by all the Upper West Side Streets Renaissance and especially Lisa Sladkus! We now will have (with some gaps, sigh) two corridors with separated bike paths stretching all the way from Harlem to downtown, on the East and West Sides. Never could have believed we’d achieve this as few as five years ago. Excellent work Lisa, UWSR and TA. I look forward to the new Columbus extension and a northbound lane on Amsterdam next year! Here’s to momentum.